LONDON – Last Saturday marked the 27th anniversary of John Lennon’s death, and as fate would have it, I happened to be in London. On December 8, 2000, I didn’t simply react to Lennon’s murder; it was my responsibility to announce the sad news to listeners tuned into Q-106, as the Claremont station I worked for was known back then. Opening my microphone and uttering the words “John Lennon is dead” was the hardest thing I’d ever done up to that point in my short life. To this day, it still seems unreal. I often wonder how life might be were the so-called “cynical Beatle” still among us. 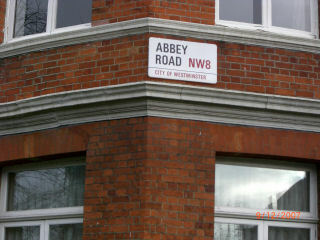 I pondered this while crossing the street (made iconic by the album cover) to stand in front of Abbey Road studios. What magic did we miss? Would Lennon’s wit have illuminated the events of our day in the same way “Give Peace a Chance” – or for that matter, “Instant Karma” – still inspire us? I have to think so. But I can only imagine what Lennon, who never shied away from controversy, might have said about, for example, the strange bedfellowship of George W. Bush, Tony Blair and the Iraq war. Even in a world with John, the hoped-for Beatles reunion probably wouldn’t have happened. A stoned-out Lennon and McCartney almost turned up on “Saturday Night Live” in the late 70’s, and that’s as close as it was ever going to get. John Lennon was, at the time of his death, the prototype of the anti-pop star. He wanted nothing more than to raise his young son and make the occasional record. Life on his terms – it’s a model that precious few celebrities follow today. The advent of technology – the Internet, digital music, mobile communications – probably would captivate John’s playful nature. I doubt he would have stood in the way of making Beatles songs available as MP3s – if he’d had any say in the matter. The Beatles were first a revelation, then a revolution and finally, a commodity. Most of today’s pop music skips the first two steps and goes straight for the money. That’s why so many new songs are heard first on TV shows or commercial jingles. If John Lennon were still alive, he probably couldn’t have stopped this onslaught, but I would have loved to watch him try. What’s to love on the local live music scene this week? Thursday: The Samples, Pickle Barrel – The return of ski season means the Killington nightclub scene is once again hot. Tonight, it’s the jazz-rock fusion of this Vermont group, called by some “the best band you’ve never heard of.” The jam-folk of Rustic Overtones is due two weeks hence, and there’s a heavy metal show next month. Down the road, the Zen Tricksters (minus ex-Dead chanteuse Donna Jean Godchaux) play the Wobbly Barn. Time the hit he slopes. Friday: Spectris, Imperial Lounge – Now a three piece band, this is not the Spectris you’ve known through the years. The addition of Josh Mosher (KAOS, Curst) on bass anchors a more aggressive, guitar-forward sound that takes its cues from power trios like Tool (and Rush, which means they haven’t completely forsaken their progressive rock roots). Check out “Entrophy” on their MySpace page for a sample of this new, edgier sound. Saturday: Méav, Plainfield Town Hall – This show was originally scheduled for the Lebanon Opera House. The former “Celtic Woman” plays solo, now with the famous Maxfield Parrish curtain as her backdrop. Méav left the band earlier this year; these shows are among the first she’s done on her own. When last in the region, the immensely popular group played the Verizon Wireless Center, so this is a great opportunity to experience her traditional Irish music in a more intimate (and quite beautiful) venue. Sunday: Christmas Revels, Hopkins Center – A holiday perennial closes its 4-day run tonight. This year’s production, “Celebration of the Winter Solstice: Music, Dance & Stories of Scandinavia & the Northlands,” brings cultural traditions from Finland, Sweden, Norway, Denmark, Iceland and Karelia. Wednesday: Beauty and the Beast, Briggs Opera House – The production of the smash Broadway musical doesn’t benefit from Disney’s unlimited budget, but with the veteran Brooke Ciardelli directing, it is quite inspired. The music – “Be Our Guest,” “Something There,” the title song – is indelible, and the story is, well, a “tale as old as time.” In the hands of Northern Stage, one of the area’s finest cultural resources, that’s a perfect recipe.